Select your roll bar diameter ----------------------------- 0.75" (3/4") Square Tubing (Roof Rack/Tire Carrier) 1.0" Square Tubing 1.0" diameter 1.125" (1-1/8") diameter 1.25" (1-1/4") diameter 1.5" (1-1/2") diameter 1.625" (1-5/8") diameter 1.75" (1-3/4") diameter 1.875" (1-7/8") diameter 2.0" diameter 2.25" (2-1/4") diameter xterra roof rack 99-2004 2.0" dia. xterra roof rack 2005 2.25" dia. TJ stock rear roll bar section 2.25" dia. TJ stock front roll bar section 1.75" dia. Early Bronco stock rear roll bar section 2.0" dia. This kit allows you to mount a small camera (2.5 lbs. max) to your roll bar on a vertical, horizontal or diagonal tube of your choice. 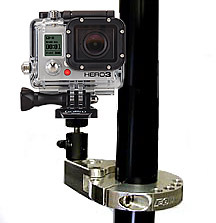 Included is our standard roll bar clamp ring, aluminum camera adapter and mini tripod head. The aluminum camera adapter has tthree mounting location for the mini tripod head. Your kit allows rotation of 360 degrees and tilting of 90 degrees so that the camera can be positioned at most any angle. Just choose your tubing diameter from the pull down menue. This product will work perfect for a GoPro camera.